It would be useful for students of Global Development to develop a critical understanding of this book because Sachs has been one the most influential economic advisers to both Nation States and global financial institutions such as the IMF over the last three decades. Jeffrey Sachs is well known popularly because of his links with Bono and his championing of the role of Western Aid and Philanthropy in helping to solve development problems. Sachs is critical of ‘grand theories of development’- such as ’70s Dependency Theory and the Neoliberal approach of the World Bank/ IMF in the 80s and 90s – but he is still optimistic that if we can engage in what he calls ‘clinical economics’ and uncover the country specific barriers there are to development in individual countries, we can develop effective strategies to end poverty- both the extreme poverty faced by the world’s billion poorest, and also the moderate poverty faced by another 1.6 billion. While development strategies need to be specific to each country, Sachs sees international co-operation crucial to ending extreme poverty and so Western Official Development Aid, good governance on the part of developing nation states, Transnational Corporations, and The United Nations all have a crucial role to play in bringing about development. Technological innovation, and Trade (including changing the rules of trade so they don’t unfairly benefit developed nations) are seen as key universal strategies to be adopted to bring about development. Sachs is also a champion of the United Nation’s 8 Millennium Development Goals – not as ends in themselves but because lack of development in each of the 8 areas other than economic well being can be a barrier to economic development, which in Sach’s mind is correlated with all other development goals, and economic growth, measured by rising GDP per capita, to be achieved through the integration of countries into the global economy through trade remains the ultimate goal of development according to Sachs. Students can use Sachs to all the popular theories of development from the preceding six decades – Modernisation Theory, Dependency Theory and Neo-liberalism. 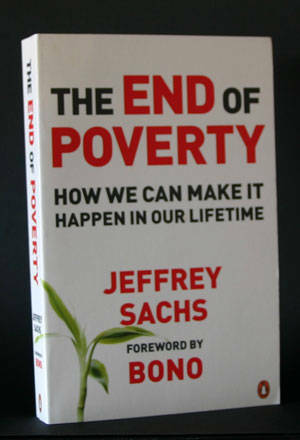 Below is a summary of selected chapters of Sach’s The End of Poverty, with some criticisms. China – is characterized by rising affluence – again like India there are millions who live in poverty, but parts of China are increasingly coming to resemble the West. Sachs in fact tells of how he first saw cell phones with cameras in Beijing, not America. To accomplish this with modest financial help from the rich countries. Some regions grew much more rapidly than others. Why did some countries grow so rapidly from the 1820s? Britain had coal – the energy source that fueled the great industrial revolution. Sachs also mentions that Colonialism was key to Britain, and Europe’s development – which involved the use of military force to press-gang Asia and Africa to the service of Western Development – Although Sach’s argues that its not as simple as the West’s development coming at the expense of India and Africa, in the long run, the West’s expansion into these regions helped bring about some, albeit extremely limited, economic growth. Colonialism and exploitation of the developing world did occur, but these are not sufficient reasons to explain why certain countries, and indeed most of Sub Saharan Africa failed to develop – which is the topic Sachs turns to in chapter 3. The Poverty Trap – Poverty itself as a cause of economic stagnation – The key problem for the poorest countries is that poverty itself can be a trap. When poverty is very extreme, the poor do not have the ability – by themselves – to get out of the mess. This is because, when people are utterly destitute, all energy goes into survival and there is no capacity to save anything for the future. Physical geography – Being landlocked or ‘hemmed in’ by mountainous terrain can prevent access to trade networks that bring about development – this is the case with Bolivia (mountains) and Ethiopia (landlocked and poor transport networks). Also Sub-Saharan Africa has an ideal climate that allows malarial mosquitoes to breed, which has decimated much of the population in recent decades. Fiscal trap – the government may lack the resources to pay for the infrastructure, on which economic growth depends – such as health care, roads, ports, education. There are three reasons for this – firstly, the population may be too poor to tax, secondly it may be inept or corrupt and finally it may be debt burdened. Governance failures – governments have a crucial role to play in development – not only through developing infrastructure but also through resolving conflicts and ensuring peace and stability. At the extremes, poor governance can result in failed states which can often lead to economic deterioration. Cultural Barriers – The two main ones are patriarchal countries which deny women equal rights with men – not only does this bar half the population from the opportunity of being economically active, keeping women in a child-rearing role is linked to higher fertility rates, and greater poverty, and also religious and ethnic differences can lead to tensions and even genocide. Trade Barriers – Some countries economies are crippled by unfair trade rules, for example The Four West African countries whose primary export is cotton are held back economically because of the USA’s subsidies to its own domestic cotton farmers. Lack of Innovation – The ‘innovation cycle’ (aka endogenous growth) is one of the main factors responsible for the West’s and now Asia’s rapid economic growth – New products being produced and consumed lead to more innovations as people develop more products related to them – (E.G. Now we have Smart Phones – people innovate and develop new applications) – Where people are so poor they have nothing, there is no scope for innovation! The demographic trap – Poverty leads to higher fertility rates (families choosing to have more children) Economic growth leads to fewer children. Women in the poorest countries have on average 4-6 children – simply put it is harder to feed so many children, and impossible to send all of them to school – resulting in a cycle of poor health, low education and yet more poverty. To cut a medium length section short – the most important factor Sachs points to not covered above is food productivity – quite simply, the reason why Asia has grown more rapidly than Sub Saharan Africa in the last 30 years is that they have experience a ‘green revolution’ – they are capable of producing twice as much food per hectare because of better irrigation and selection of more modern species of crop. He also mentions the fact that ‘natural shocks’ have prevented some countries from developing. He then gives a few examples of different countries that have experienced a selection of the problems above in the years since WW2. Geopolitics – Cross boarder threats (wars/ refugees) and also trade relations. So, at the end of the day, by 2005, this was the bottom line of development theory – it maybe flippant to say this about one man’s life work – but it don’t sound like rocket science to me! Of course I am aware of the fact that doing the analysis and implantation is an extremely time consuming task. He puts too much emphasis on economic growth as a goal in itself – It is quite clear that economic growth does not yield uniform increases in quality of life across all countries – take Saudia Arabia, and possibly Nigeria as examples of countries you probably don’t want to live – but they have either a high GDP or a rapidly growing economy. ‘Clinical Economics’ maybe just sounds like an excuse to employ thousands of more ‘development experts’ to diagnose developing countries specific problems. Sachs also fails to acknowledge the work of developing world economists who came up with many of the ideas he seems to present as his own in The End of Poverty. This post by John Vidal is also pretty scathing – among his point he argues that ‘Sachs seems to be suffering a dose of advanced consultivitis – symptoms include a swollen ego and a fervent belief that you can change the world. In a work littered with tales of meetings with presidents and global dignitaries, he plays the moral economist who goes from country to country handing out pills and mopping the fevered brows of administrations in economic crisis’. Even though he suggests (eventually) that aid can be an effective means of lifting a country out of poverty – he fails to give any examples of where aid has actually been effective at helping a poor country ‘take off’ successfully. A summary of one thread within this excellent book…. The DFES (2013) has an overwhelmingly positive view of the future role of ICT in schools and colleges, noting that it has transformed other sectors, that parents and pupils expect it, and that pupils need ICT to equip them with future-work skills. In DFES literature, digital media seems to be presented as a neutral technology through which individual students can be empowered, with emphasis on the benefits such technology can bring to schools, such as more personalised learning, better feedback, a richer resource base and the possibility of extending the learning day. This discourse further constructs not only technologically reticent staff and lack of access to ICT resources as a potential problem, but also centralised government itself, with the forthcoming renewal of the ICT curriculum being fully endorsed and authored by Google, Microsoft, and IBM, with the vision being that 16 year olds will be able to write their own apps by the age of 161. There are, however, those who are skeptical about the neutrality ICT, the claimed inevitability of its expansion and the supposed benefits of the increasing digitisation of education. One such skeptic is Sociologist Joel Spring who, in a recent book, Education Networks: Power, Wealth, Cyberspace and The Digital Mind, draws our attention to the increasing control of education systems around the world by global corporations, a process which he refers to as Educational Corporatism. According to Spring, a global shadow elite network is responsible for encouraging the growth of Information Communications Technology in state education programs in the USA and increasingly in other countries, something which is unsurprising given that the global education market is a $7 trillion industry, greater than the value of every other information industry combined (WEF 2014). This network consists of a relatively small number of IT and communications company executives who have close links with senior policy makers in governments, who together have overseen an increase in the use of ICT for the surveillance and education of students. Spring characterises this network as a ‘Flexnet’ because the key actors, or ‘Flexians’, move between government departments and education, media and ICT companies, spending a few years working respectively for one government department before moving to an ICT corporation, and then back to the public sector to spearhead technological initiatives drawing on their corporate contacts to do so, and finally moving back to a more senior Corporate role, supposedly to take advantage of the profits generated from said initiatives. The means whereby Flexians within the global shadow elite operate is illustrated by the Corporate takeover of New York City Schools. In 2001 billionaire and superlcass ICT mogul Michael Bloomberg was elected mayor of New York City. After lobbying for and gaining control of New York schools, Bloomberg appointed as school chancellor Joel Klein, a lawyer from another ICT conglomerate, Bertelsmann. Technically Klein lacked the legal requirements to head NYC schools, but this requirement was waived by the state commissioner for education. Klein initiated changes that centred on student testing and data collection (echoed in education ministries around the world). To aid in this, he contracted with the company Wireless Generation to use their ‘ARIS’ system of data collection and management. Klein then left his position as chancellor to become executive vice president at Rupert Murdoch’s News Corporation, which bought 90% of Wireless Generation for $360 million. In addition to the above, while Klein was chancellor, Murdoch’s New York Post also supported Klein’s efforts to establish more charter schools and undermine protection for teachers. At a global level, the shadow elite influence governments through The World Economic Forum and The United Nations, which both voice considerable optimism about the future role of ICT in meeting the world’s educational needs in the future. As an example of this optimism, Spring points to The World Economic Forum’s Global Information Technology Report 2010-11, authored by prominent members of the Shadow Elite. Where education is concerned, the report anticipates ‘Transformation 2.0′, a process in which educational institutions will make increasing use of analytic software tools which convert data into actionable insights. This not only means the now well established use of data on students’ past test results to predict the probability of their passing or failing certain subjects and then directing resources more efficiently to those in need, but the report also predicts the increasing use of ‘data exhaust’, or more qualitative information collected on students throughout their school careers, for the same purposes which in the future might mean increasing surveillance of the number of and length of virtual interactions students make each term in in order to inform educational interventions. Individual schools and universities do not possess the resources to develop and maintain the kind of software required to collect and collate such ‘Big Data’, so ‘transformation 2.0 might see educational institutions becoming locked into long-term data-analytics contracts with global ICT companies: The future of education might be one where schools do the teaching at a national level but informed by data analysis carried out by global corporations using global data sets. To use ICT to make education more engaging and better suited to the needs of each student through making greater use of data analytics and what Spring calls ‘edutainment’ software, which special emphasis being given to promoting STEM subjects. To better link technology to assessment. To support access to online instruction in and out of school. To increase ‘productivity’ in the education sector: ICT is seen as a relatively const-efficient means whereby schools can accelerate student progress, rather than employing more teachers. According to Spring’s analysis this vision is ideological and it represents a global Neoliberal agenda for the progressive privatisation of education through governments spending more public money on data analytics, online instruction and assessment delivered by global ICT corporations. It is already the norm in the US for IT and communications companies to develop educational software which are provided to schools for a profit, a practice which the ICT elite wishes to see replicated in other parts of the world. The ICT Shadow Elite’s ambitions are not limited to developed countries, they are also targeting the education sectors of developing countries, and as an an example of this Spring cites the Microsoft-UNESCO agreement established in 2009 regarding ICT and Higher Education. As part of this agreement, Microsoft offered £50 million of ‘seed money’ to introduce a range of educational technologies to a number of countries – such as DreamSpark, MicrosoftLive@edu, Digital Literacy Curriculum, and The Microsoft IT Academy Program. Spring’s theory is that such an initial seeding will reap dividends in the future as public education sectors expand they will spend increasing sums of money on upgrading software and buying related ICT educational products from Microsoft in future years. Spring points to several possible negative consequences of global companies effectively having more control over national education systems. Firstly, this is likely to further reduce educational management to the employment of data mining and analysis to predict how student test scores and graduation rates relate to social characteristic information and identifying which limited interventions can be made to improve examination results, with the effectiveness of teachers further reduced to how efficiently they can enhance these measurable results. Secondly, it is likely that there will be an increasing level of control of knowledge by ICT corporations. The concern here is that this will lead to the further standardisation of knowledge into a form which can be easily assessed through technology, which potentially means preferencing quantifiable knowledge over more qualitative and critical knowledge which require more human intervention to asses. In addition to this, schools are increasingly likely to be seen as institutions whose job it is to provide a 21st century workforce for ICT firms, meaning the preferencing of STEM, ICT and business related courses. Thirdly, the corollary of greater control being handed to global ICT corporations is declining autonomy of individual schools and teachers. This actually seems to be an explicit goal of the global shadow elite: the WEF (2011) states that the main barrier to extending technology in is ‘human’, with ICT, rather than more teacher-time being (quite literally) sold as the most effective means to personalise learning in order to meet the needs of each learner. Another idea which potentially undermines teachers which is widely publicised by prominent Flexian Bill Gates is that we should have least one good course online for all subjects rather than lots of mediocre ones. This idea seems both sensible and inevitable but its manifestation might come in the form of a core of highly skilled experts constructing corporate-approved online content for a global education market, with for-profit companies responsible for managing testing and tutoring replacing much of the work teachers currently do. A final possible consequence is an increasing inequality of educational provision. As governments struggle with finances in the age of ideological driven Neoliberal austerity, it might be that cash strapped schools move towards providing online only tuition for some courses while students at better managed and funded schools retain more formal ICT-supported lessons. This is precisely what happened in Florida in 2010-11 when 7000 students in Miami-Dade county were placed in virtual classrooms in order to beat the state’s class size mandate, which specified a maximum of 25 students per class, but did not apply to virtual classrooms. While the increasing use of ICT in education appears to offer many benefits, such as enhanced personalisation of learning and increased teacher productivity, the importance of Spring’s analysis lies in reminding us that while technology itself is neutral, the way in which it is deployed is not given the corporate networks and which are currently lobbying for the further digitisation of state education, and the neoliberal agenda of which this is a part. At present it is difficult to see how anything can halt the spread of Educational Corporatism: there is a clear demand from today’s students and their parents for digitised education and global ICT corporations are clearly well positioned to play an increasing role in the delivery and management of virtual learning environments; and with further government cuts likely, the viritualising of learning seems an obvious way to save money in the education sector by reducing the number teachers. Whether or not the future of education will be one of reduced teacher autonomy with for-profit Corporations having greater control over national curriculums and thus even more access to students, and what the effects of this will be remain to be seen. C. Paucek et al (2014) Chapter 8: Online Education: From Novely to Necessity, in World Economic Foundation: Education and Skills 2.0: New Targets and Innovative Approaches. Geneva: Switzerland. Spring, J (2012) Education Networks: Power, Wealth, Cyberspace and The Digital Mind. New York: Routldege. Kindle Edition. A recent parliamentary report has found that poor white boys and girls do worse in schools than children in other ethnic groups. How much worse do poor white children do? The achievement gap between poor white children and rich white children is much larger than the corresponding gap between poor and rich children from other minority groups, and the gap widens as white children get older. How has educational performance changed over time? The achievement rates of poor white kids has actually improved signficantly in the last decade – in 2008 only 15% of white pupils on Free School Meals got 5 good GCSEs, which has now doubled – the problem is that pupils from more affluent backgrounds have also improved, meaning the ‘achievement gap’ has stayed the same for white kids – today 65% of better off white children get 5 good GCSEs compared to only 32% of FSM white children, meaning a and achievement gap of 33%. This trend is different for ethnic minorities – poor minority children have closed the gap on their wealthier counterparts. For Indian and black students the gap between rich and poor is only 15%, and for Chinese students it is 1.4%. This has led some to conclude that there must be cultural differences influencing the way poor white British children approach their education. Do Cultural Differences Explain why White Working Class Underachievement? White working class boys and girls are more likely to have anti-school attitudes than other minority groups, they play truant less, and they spend less time doing homework – an average of 2.54 evenings a week compared to 3.13 for black African and 3.29 for Indian children. There is less support for the idea that white working class parents and their children lack aspiration – For a start, 57% of British people identify themselves as working class, while it is only the 12.5% on Free School Meals who are doing very badly at school – so it is more a case of there being pockets of underachievement rather than the whole of the working class underachieving. There is also evidence that working class children, especially young children, have high ambitions. There are plenty examples of academies which have been set up in deprived areas which have helped local working class kids get good GCSE results. In 2003 New Labour launched ‘The London Challenge’ to drive up standards, and invested £80 million in leadership, targeting failing schools – about 80% of schools in London now have ‘outstanding leadership’ according to OFSTED and 50% of children in London on Free School Meals get 5 good GCSEs, irrespective of ethnicity. The problem is that this initiative might not work outside of London – London has a prosperous economy which makes it easier to attract the best leaders and teachers, and also benefits from the positive impact of immigrant families. In 2013 the chief inspector of schools, Michael Wilshaw, identified a geographical shift in educational underachievement – away from big cities and crowded, densely packed neighbourhoods, to deprived coastal towns and rural, less populous parts of the country. Such towns suffer from fragile, seasonal economies, an inability to attract good staff, a lack of jobs for young people, and scant opportunities for higher education – all of which contributes to a vicious cycle of underachievement, perpetuated further by the ‘brain drain’ – anyone that does get qualifications leaves because there are no opportunities to use them in the local area. In such areas, simply building swish new academies don’t seem to be enough to improve results – In 2005, the so-called worst performing school in the country, Ramsgate School, was transformed into the new, £30 million Marlowe Academy. SIx years later, it fell into special measures. Summarised from ‘The Week’, 2nd August 2014.